With extensive experience, resources and demonstrated expertise, CCI is the ideal strategic partner to help you maximize the value of your public or private sector service organization. Identify the areas of your operation that can yield greater efficiencies, benefits and/or cost savings. Recommend specific solutions for realizing those advantages. Cost-justify the components of each solution to ensure real, measurable returns on investment. Implement innovative solutions that will produce long-term results. CCI offers broad-spectrum consultative services that can be structured to meet the most rigorous objectives for sales and service organizations. CCI services can be used individually or in combination to address the exact scenarios and challenges your company faces as it transitions service to the core of an effective ongoing CRM initiative. 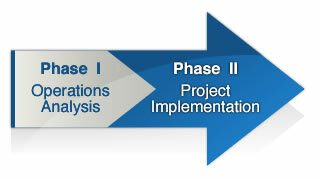 Broadly, services are delivered in two phases: First, Operations Analysis, followed by Project Implementation. In the analysis phase, we work with you to articulate your current technology position, challenges and objectives, then recommend innovative scalable solutions to help you make significant improvements throughout your operation. A customer-focused service architecture for one or multiple sites that best merges existing systems with proven technology. An actionable strategy for acquisition and implementation of required systems, technologies or facilities. Unbiased vendor-agnostic recommendations for best-of-breed solutions from industry leaders. Facilities planning, systems integration and project management expertise, as needed. Protocol and procedures development and training at all level of the operation. In summary, CCI’s expertise and core competencies can be used in any necessary combination to address your requirements. Whether you need to build, improve or thoroughly re-engineer your service operations, CCI has the experience and know-how to create solutions that provide functional excellence on every call and measurable ROI for the long term.